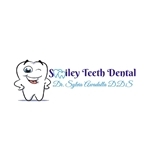 Smiley Teeth Dental (Saddle Brook) - Book Appointment Online! Welcome to our office! At Smiley Teeth Dental in Saddle Brook, NJ we offer patient-centered, comprehensive dental care for your entire family. Our goal is to promote optimal dental and oral health by emphasizing preventive methods. It’s best to prevent dental diseases than to treat them. At Smiley Teeth Dental, it’s our responsibility to guide our patients and teach them how to prevent potential dental problems and eliminate risk factors. We provide a wide variety of oral health services, including restorative dentistry, implants, endodontics (root canals), cosmetic veneers, crowns, teeth whitening, dentures, Nonsurgical Perio Therapy, as well as oral surgery. This was the greatest dentist I have ever worked with. Her and her assistant were extremely friendly and answered all of my questions! I was seen immediately. Looking forward to making a lasting relationship with this practice!